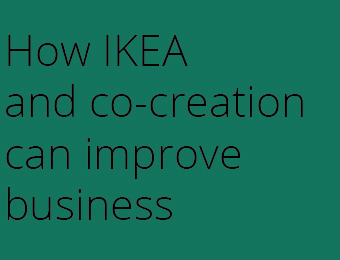 This idea is about the “IKEA effect” and how it can help your business to change the way you think about products and to enable co-creation within the marketplace to achieve a higher valuation of your products. The “IKEA effect” is a cognitive bias that occurs when people place a disproportionate high value to products they have been involved in the co-creation of. As outlined above the “IKEA effect” is the concept of people attributing products a higher value if they have been involved in co-creation. In comparison to people that had no involvement in the creation process which valued products much lower. The classic study consists of 2 groups of people that are presented with the Kasset box from IKEA. For the first group it is pre-assembled and they are tasked to evaluate the product and place a maximum bid on what they think the product is worth. Group number 2 is presented with the same task but they are first asked to assemble the box according to the IKEA instructions. What studies regarding the “IKEA effect” finds is that the group that assembled the boxes valued them higher then the group that just evaluated boxes. The reason for the higher evaluation is believed to be due to our human psychological needs to signal competency to ourselves and to others, and that these feelings of competency associated with self-created products lead to an increased overall valuation of the own person. How can your brand then tap into the “IKEA effect”? Depending on which industry you are in there should be plenty of opportunity to apply this type of thinking to your business. As a starter you could involve consumers in the design process of your products or you could use your consumers as a part of your workforce by delivering “almost ready” products. One example in FMCG is selling ready made pizza dough that consumers can co-create with instead of selling ready made pizza, chances are they will value the end result higher if they were involved in the creation of the end result. If we look at other industries parts of your production or assembly process could potentially be outsourced to your own customers to save costs while also increasing the perceived value of the product for your customers by co-creation. The key takeaway from this idea that you can apply to your business is the question of how your brand can enable consumer to co-create to achieve a higher valuation of your product? If you can combine co-creation with the psychological need people have to feel smart this could empower your business to save both costs and to make it more successful.